Starring: Jason Statham, Jessica Alba, Tommy Lee Jones, Michelle Yeoh, Sam Hazeldine, John Cenatiempo, Toby Eddington, and Femi Elufowoju Jr. Living undercover in Brazil, master assassin Arthur Bishop (Jason Statham) springs back into action after an old enemy (Sam Hazeldine) kidnaps the woman (Jessica Alba) he loves. To save her life, Bishop must kill an imprisoned African warlord, a human trafficker (Toby Eddington) and an arms dealer (Tommy Lee Jones), all while making the deaths look like accidents. When things don’t go exactly as planned, Bishop turns the tables on the people who forced him out of retirement. I have some funny experience when I was going to watch Mechanic: Resurrection. I didn’t know the full title of this film until like two minutes before I went into the theatre. I thought it was Mechanic Resolution or Mechanic Revolution or anything but Resurrection. I don’t even know what is it about until the lights in the theatre were off. Up until then, I still don’t know what I was going to watch, only that there are Jason Statham, Jessica Alba, and Michelle Yeoh in this film. And then after five minutes, I just realised that this is the continuation of The Mechanic (2011). By then, I kind of regret it when I agreed to watch it. You see, the last time I watched The Mechanic, I fell asleep. I fell asleep even though it’s a fighting scene and I rarely fell asleep in a fighting scene, because, you know, it’s a fighting scene! It was supposed to be really exciting and tense. So yep, you can imagine how boring the film must be. Therefore, after five minutes since the beginning of Mechanic: Resurrection, I didn’t expect much. I didn’t expect the film would be good and I was right. Here’s the thing. Everything happens so fast that I have to digest what is going on. They didn’t explain much about Michelle Yeoh’s character either. It’s a little bit of confusing. Suddenly she was there and advised Arthur Bishop to do some unexplainable things. Told him to help a total stranger. I mean, who is she? I don’t know if it was just me or they didn’t really explain why the character Arthur Bishop must kill three people. I mean, I get it in the end, but I think it’s a plot that doesn’t make sense and force to make sense. You know what I mean? At least, give us some glimpse of why he has to kill the three of them, not just randomly kill or something. I also think that the relationship between Bishop and Gina happened really really really quick. I know the running time is limited, but aren’t they make the development of the relationship too quick? There are many ways to make the relationship happened faster but not making the audience confused. I’ve seen it before. However, in Mechanic: Resurrection, I honestly don’t understand why they only spend a couple of hours together and seemed to like each other later. The question came because they looked pretty much hate each other at first but just in one moment or once dance, they suddenly decided to like each other. Even the moment is not that impressive or romantic or any way at all either. My brain really can’t digest the relationship at all. Luckily I didn’t fall asleep this time. The action in Mechanic: Resurrection is pretty good, but the story is not at all. The way they took the scenes wasn’t good either. I can see they did some scenes on a green screen. The CGI effects aren’t good enough to me. It looks pretty fake in some scenes. I think mostly they only relied on Jason Statham’s fighting scenes or perhaps looks—even though to be honest, I definitely not impressed with his looks either. To tell you the truth, Mechanic: Resurrection does have good fighting scenes but I am not impressed. 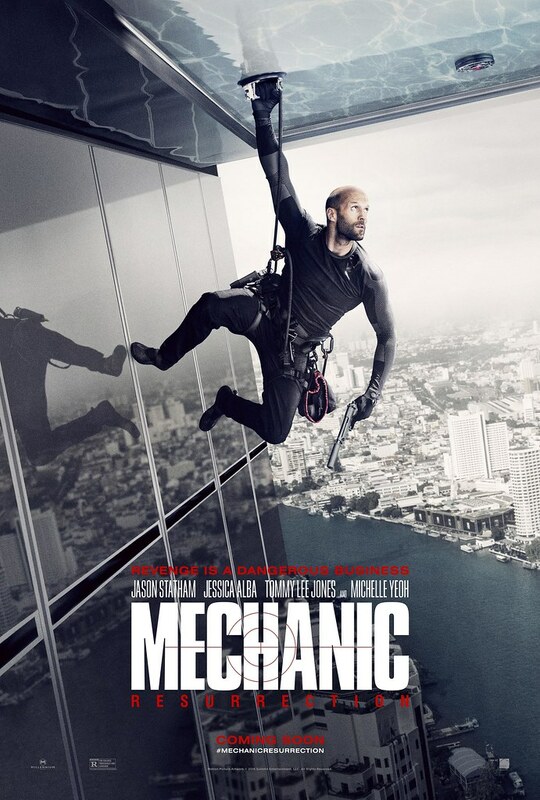 To sum everything, I don’t think Mechanic: Resurrection is a good film, but it isn’t a bad film either. Not every scene is taken poorly, but you’ll find some of them look too computer-making. The CGI effect wasn’t done smoothly and therefore the scene looks pretty fake. The fighting scene isn’t bad, but the story is, in my personal opinion, not very good enough. Kind of not clear enough. It’s like I am missing something from the story even though I’ve watched it from the beginning without sleep. I give Mechanic: Resurrection 6 out of 10 stars.